Hello, Ribbon Lovers! 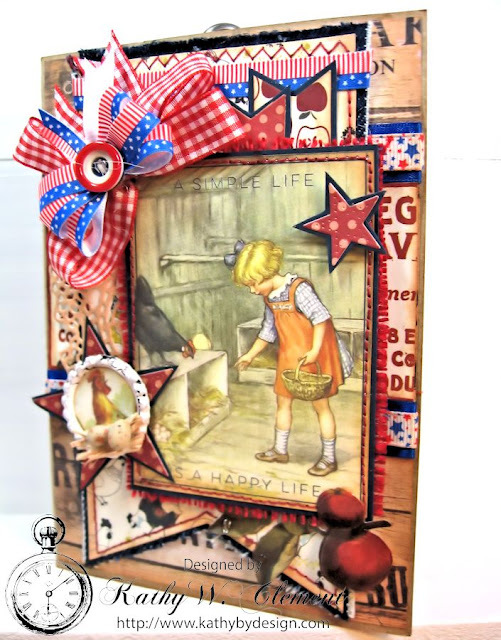 It's Kathy here with a sweetly vintage card featuring the May Ribbon Club Collection. Have you seen these fabby ribbons yet? This red, white and blue color palette is one of my favorites. It's perfect for Memorial Day, Flag Day, 4th of July and other patriotic projects. I super love them! So many pretty ribbons to choose from! This collection is also great for vintage cards and layouts.. Take a peeky at how I used them in this darling card made with Authentique's "Homestead" paper collection. See what I mean? They look amazing with these vintage papers! I created a belly band with paper from the collection, and then added beautiful Electric Blue Double Faced Satin Ribbon above and below it. 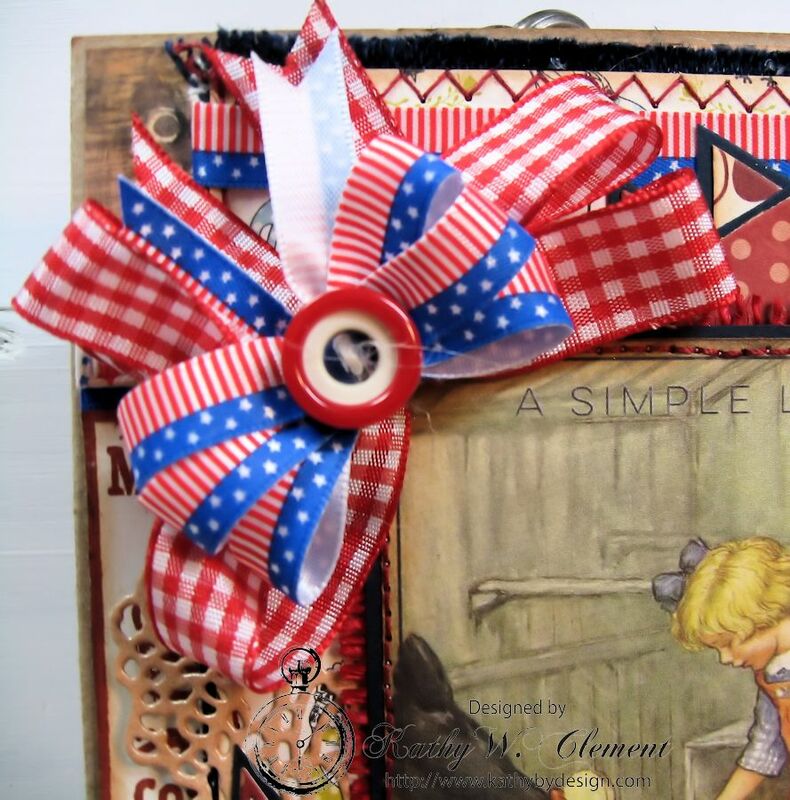 This was topped with festive Random Patriotic Stars on White Grosgrain Ribbon. To give it a little more of a vintage vibe, I lightly tapped the ribbon with Tea Dye Distress Ink before layering it on with 1/4" Scor-Tape. I really love the way that Scor-Tape holds ribbon and keeps the ends from fraying! The top of my banner flag is festooned with gorgeous 3/8" American Flag Print Satin Ribbon. I love the way this draws the eye to the stitching detail on this denim-backed banner flag. The red burlap panel adds wonderful texture and plays along with the vintage Americana vibe of the card. I painted a bottle cap with Picket Fence Crackle Paint, then added a circle punched rooster to the center. A little straw and some speckled brown eggs were added just for fun. 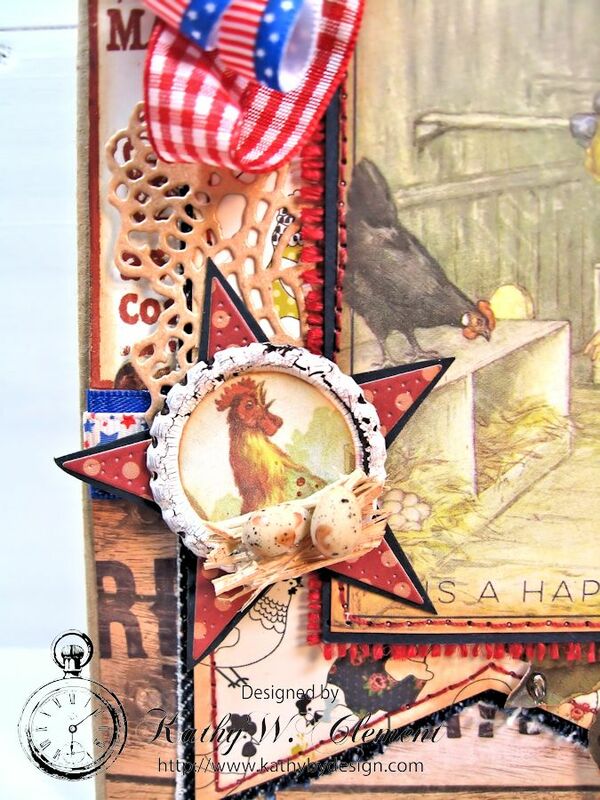 This cute embellishment is layered on top of a die cut star, and with the smaller star in the upper right corner, it serves to "frame" the focal image. Lately, I've been on a kick where I'm going wild finishing the inside of my cards. It's so much fun, and it turns a simple card into a real gift. 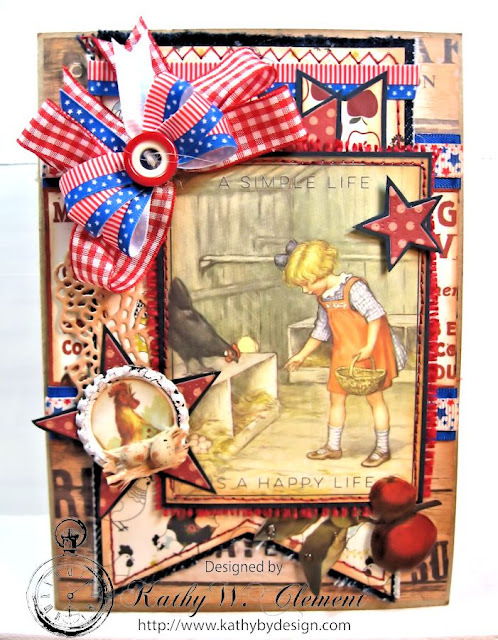 On this card, I added a pretty border of the American Flag Print Ribbon along with layered papers and images from the collection. The right hand side has a slash pocket that I filled with a pretty tag that can be used for home decor. The tag is embellished with a sticker from the collection and then you know I had to get into my embellishment box and search for something fun to add. 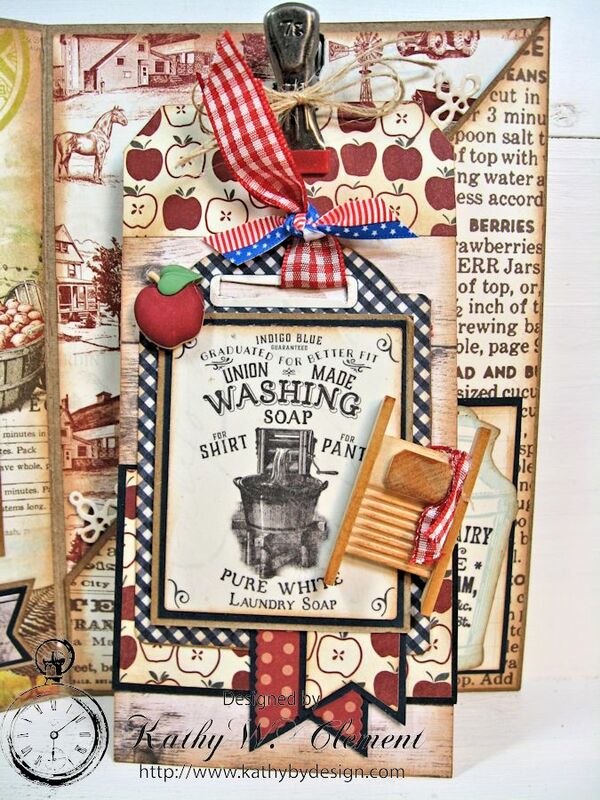 The little wooden washboard was inked with Vintage Photo DI and then draped with a scrap of Red Plaid Ribbon. It's so cute that it made me clap my hands for joy! Then I added a little apple button, a vintage clip and more ribbon and burlap string to the top of the tag to finish it off. I think this card could be used for a kitchen shower or a birthday present and it would make a fantastic housewarming gift! 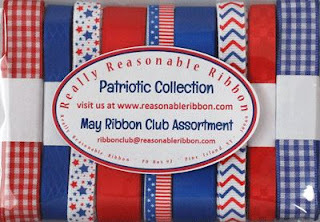 The versatility of these ribbons is so exciting: nautical themes, sports themes, kitschy kitchen, vintage and of course, patriotic projects as well. What would YOU make? I'd love to hear in the comment section below! 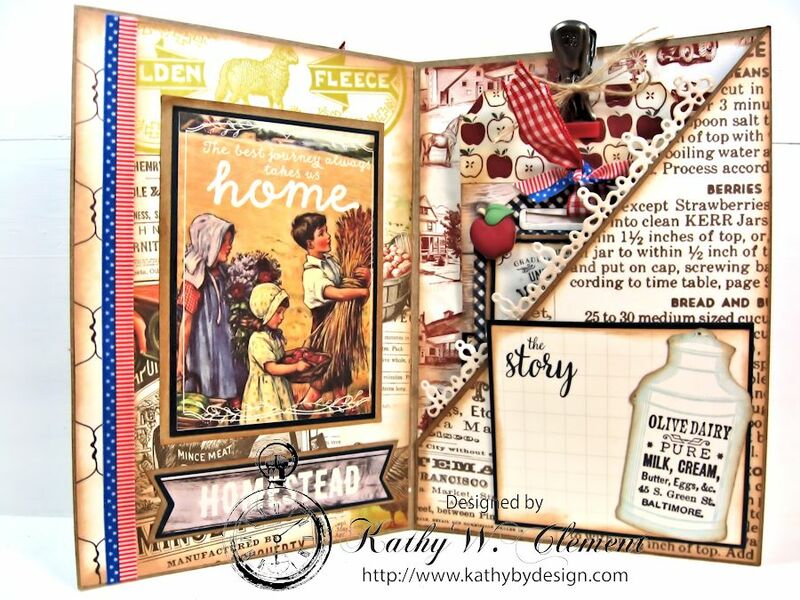 A super nostalgic project Kathy and the ribbons look amazing on it.